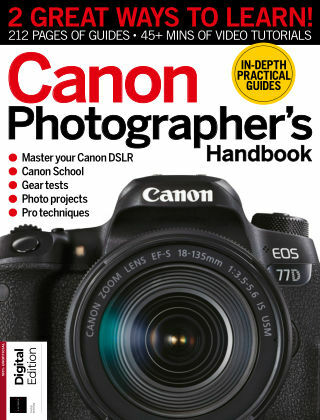 With Readly you can read Canon Photographer's Handbook and thousands of other magazines on your tablet and smartphone. Get access to all with just one subscription. New releases and back issues – all included. Welcome to the new Canon Photographer’s Handbook, the in-depth guide that will help you take your Canon DSLR photography to the next level. Whether you’ve just bought your first EOS camera, or are a serious enthusiast, you’ll discover essential camera tips and techniques to ensure that you master your Canon DSLR in no time. The following sections are packed with expert advice; Camera Skills includes guides on getting perfect exposures to learning how to use different lenses. In Canon School we go in-depth into key camera settings, including aperture, shutter speed and ISO control. In Essential SLR Skills, learn how fellow amateurs improve how they shoot specific photography subjects, by spending a day with a top Canon professional photographer. In our Photo Projects section we provide inspiration and creative topics to photograph, accompanied by free video guides that you’ll find on FileSilo. We round things off with our Gear Tests, which include tests of Canon’s latest and greatest enthusiast-level DSLRs, plus a group test of superzoom lenses for flexible shooting. We hope you enjoy reading this Canon Photographer’s Handbook and it helps you to start improving your photography today.